A few days ago, I read and article about a 15 year old girl who saves 40 elementary school kids while riding on a bus and then gets suspended. Here is the article. The high school girl got on the bus in the morning and didn't get off at school because she asked the bus driver to take her back home because she felt sick. The bus driver gave her consent and decided to take her home after dropping off the elementary school kids. While driving to school it says the driver bumped their head and was un-conscious. The 15 year old girl then got up out of her seat and applied the breaks after the bus had already hit two cars. The school deemed that she should be put into Saturday school which lasts over 5 hours on her Saturday. I guess I am saying what kind of messed up school is this? The principal has the authority to to override this detention and they didn't. I wonder if they even gave her a medal or a medallion for saving 40 elementary school kids from a freak accident! I thought this 15 year old is very much inspiring. In today's world, you don't hear much about hero's. You only hear about violent crimes and criminals, the news doesn't cover the good deeds because they only cover the bad deeds. I think and I imagine every other person that reads this and the families of those 40 kids are extremely thankful for what she did. I grew up watching Michael Jordan play ball and watching Super Man always believing he was real. I saw plenty of heroes in my day as a kid. Today though, I don't see many heroes in this world as there should be or a person would hope there would. I just hope those 40 elementary school kids still find heroes in today's society. I am a bit older without kids, so I don't know what kind of heroes kids have, I just hope they are out there. As for the 15 year old, I think she will be my hero and inspiration for at least a week. For something that has not been in the news, Google and TiVo just joined up to launch YouTube video viewing on TiVo boxes by year end. YouTube videos are watched about 66,000,000 times a month and now you will be able to watch it at home if you have a broadband connection and a TiVo Series 3 box. Just imagine the advertising revenues Google will bring in for YouTube that has YET to produce significant profits. Everyone in the country has a TV, not everyone has a computer. Google is just satisfying their over all goal, which is to organize the worlds information. Just imagine, no more TV programs and large TV companies that demand a specific amount of commercials. These companies have already started to post their shows online the day after it airs, just imagine the shows now straight to your TV instead of Illegally downloading them on things like Torrents. So I read an article today about Kevin Ham. Anybody heard of him? This man has not only been named "The man who own's the Internet", but also beats out Internet Moguls like John Chow. Kevin, built a 300 million dollar empire over night. On what you say? Buying up Internet domain names and throwing advertisements on each site he bought. Why does this idea make me not only upset, but Furious? Well, first it was a GREAT idea to buy up the domains. Hah, I wish I though of it first. Why does it make me mad? Well, because when I go searching for a new domain name to add and actually put content on, He already owns them! I honestly wish the United States would call this a monopoly on domain names and force him to let go of most of them. The Internet is free and I would rather like to see great content out on 300,000 domain names than advertisements. It would make the world a better place, I think. I actually wonder if the politicians know about this at all? Well, it just disappoints me that content can't be put on sites like these, but It does say at the end of the article that Kevin plans on putting content on the sites, but how long and what kind of content would he actually decide to put on the sites. That also brings on another thought, if he does not like the content then he can be a dictator as such and have it removed. This I think is a form of obstructing free speech. I recently had to setup all my new blogs on GoDaddy this past weekend and it was a pain! Let me tell you what, I would hope that others find this post so they don't have to go through the same thing. I found a old post with not up to date information on setting it up. 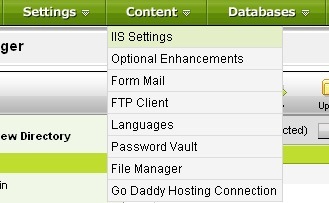 So here is the up to date version as of 3/12/08 and GoDaddy Hosting Control Center V2.5.0. 1. Go to http://www.dotnetblogengine.net and go download the entire source located here. 2. Remove the following line from web.config. This is due to Godaddy has medium trust set on the site. 3. 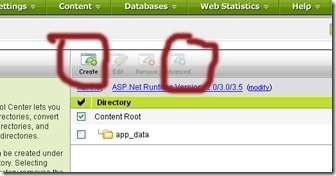 Publish the site using any sort of FTP upload client or even Visual Studio. I would not compile the website. Let the website compile it self on GoDaddy. 4. 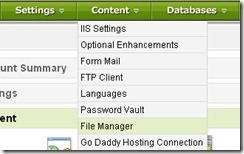 Open up GoDaddy and the Site Configuration manager. 5. Go to the File Manager. 6. Check Mark the App_Data folder and then click the permissions button as circled below. 7. Set the access to Read, Write and Reset all children to inherit. This will allow all files under it to inherit the above settings. 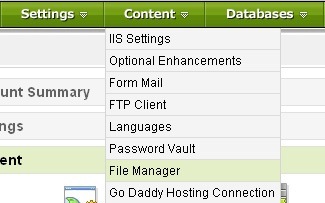 This allows you to move files in and out of App_Data folder and not having to keep updating the permissions in GoDaddy. 8. Click okay and then move on over to IIS Settings. 9. 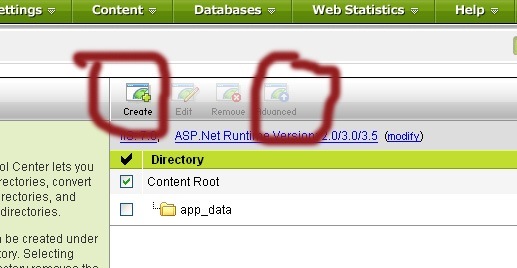 Create a Folder called App_Data. Before you complete the next step, let me advise you that BlogEngine did not say to do this, but I found it to be the only way to get BlogEngine to work. So now Click on the Advance button. Click the Classic Settings. From here it will take a few hours to set up and if the admin's are really good, it will be done in about 30 minutes. Are you using the Excuse that your TOO busy? Ladies and gents, I must say that the little things in life are what matter most. It is the little things that make life worth every second you have. Do you as a person use the phrase "I'm too busy, maybe later?" Well I am here to tell you that its just an excuse and you only use it to spend less time on something like kids or your family. Life is too short to actually miss the little things in life. Children do not care about a paycheck, your wife or girlfriend does not care how much money you make. They care about the time spent. I know I have slacked off in areas where I said I was just too busy to do something. Everyone has, but how about saying "ya, okay lets go for it" Bottom line, life is too short to always be chasing the dollar so that your family lives comfortably. I know one person in particular who has neglected his kids because he was always chasing the dollar. I say, take a break and relax. Take some time off to rekindle the relationship. Take some time off to just get away or even play with your kids if you have them. Honestly, what will it hurt? Work will always be there and if you don't do it, someone else will. Work gets done by someone else, the job DOES NOT need you. They only want you. I know what you can do, devote at least an hour every night to do something you want to do or is self fulfilling. Volunteer, go to the park, participate in church activities. Just get out and relax, stop chasing that dollar! Since Linq came out people have been working hard on the application. I found a great application that supports linq queries pretty well. I am happy to see development come out of new microsoft technology. The application is called Linqpad and I just wanted to point that out. I thought these things need to be pointed out when new technologies came about. I like to write about inspirational things. In fact, this blog is all about inspirational things I find in my everyday life. I found another and wish to share it with the crowd. I saw a video about two weeks ago. The video took about two hours to get fully through with a few distractions from my girl friend. Let me give you a brief intro before I share it with you. Randy Pausch has accomplished so much in so little time. He was stricken by cancer in the late part of 2007. He was given 3 to 6 months to live, but due to his latest video, he has become an instant celebrity. Let me not say celebrity, but a person that will be remembered for long time to come. Randy is a professor at Carnegie Mellon in the computer science department. He studied at Brown University and received his PHD at Carnegie Mellon. He taught a course called building Virtual Worlds at CMU which then lead his career into the hands of Disney Imagineers and if you know anything about the Imagineers you would be impressed. It is basically Disney's R&D department. The Imagineers create everything from models to 3D virtual worlds. He has consulted with Google on interface and design and also worked at Electronic Arts. This is where it gets interesting. He has been called one of the smartest persons people know by his colleagues. He has a great attitude and has been destined to change the world ever since his conception. Just from watching this video, I honestly feel I have had an inspiring moment in my life. That is why I bring it to you. The Last Lecture (video Link here) has been viewed over six million times and gives allot of valuable lessons. I suggest watching it in a quiet environment to actually pull everything in. This is one of my favorite lessons, shows wether people can be good and fun or just plain boring. Never lose your childhood fun and excitement. I am always a kid at heart. There would be peace in the world if everyone helped one another. I sure hope you liked this post as much as I have. Thanks for visiting. UPDATE: Randy Just came out with this new video about pancreatic cancer. Thought I would put it up for people to see in support for help of pancreatic cancer.